All Howard County High School Students are invited to participate in the Biotechnology Career Academy. 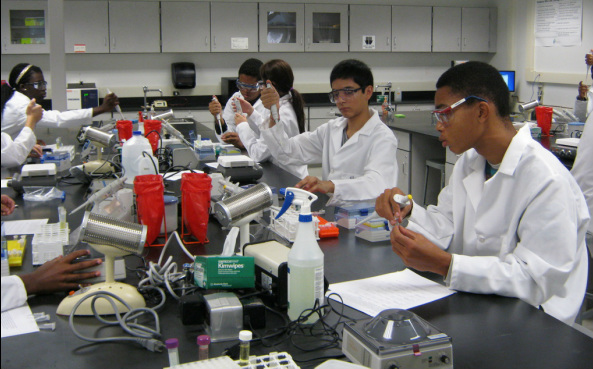 The Biotechnology Academy provides an extraordinary learning experience in applied science. HCPSS buses provide transportation between local high schools and the Applications and Research Lab, where the program is held as a portion of the regular school day. Biotechnology I G/T and Biotechnology II G/T provide a framework for a wide range of careers and an outstanding preparation for college science courses. Biotechnology is the use of the cells and molecules of living organisms for science, medicine, agriculture, ecology, industry and forensics. Students sharpen their skills in technical writing and applied mathematics. Academy courses focus on cell and molecular biology (DNA, RNA, proteins) and the related lab techniques. 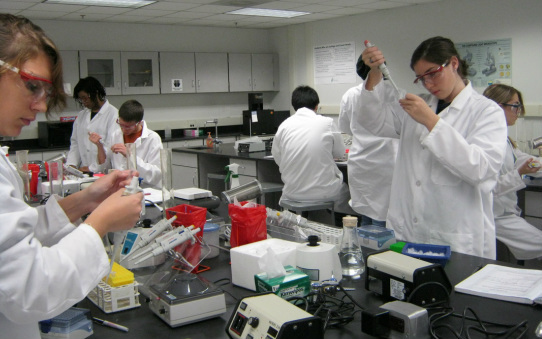 Students use modern laboratory equipment to perform cutting edge experiments. They analyze student-generated scientific data, rather than idealized data as seen in textbooks. They diagnose diseases, genetically modify an organism, analyze crime scene evidence and analyze protein produced in bacterial cells.